Looking at the trailer of this movie I was sure about the beginning of the story - a corporate guy (I prefer to call it an IT guy as I can relate to it) who is bored of his daily routine life of 8 hrs working, parties with colleagues, corporate etiquettes, formal 'how are you?' type questions. To take a break from these things he goes on a vacation (it was not explicitly stated in trailer that whether this vacation was permanent or temporary?). He lands up in the Corsica, an island to the south of France's mainland. This island is another new find by Director(Imtiyaaz Ali) who had earlier shot in several European countries. Frankly speaking this office routine things were too much generalised in this Imtiyaaz Ali's movie. India is different man, here we have more than just individual life. We have institutions of marriage, community, society, religion, politics, cricket, movies etc which will always pressurise the guy or gal to follow routine circus. Anyways, let's jump towards real crux of the movie. Movie is ahead of the typical Bollywood movies but it is still far behind the Hollywood movies from which it looks to be inspired. 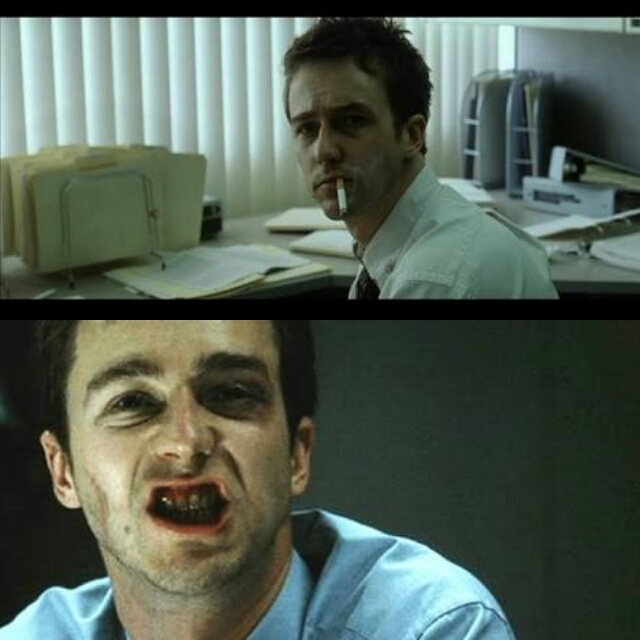 2 movies which I can directly mention here are Fight Club (1999) and American Beauty (1999). Common thing about these movies is that both of these were released in 1990s American times when corporate routine was making life of upper middle class strata of society quite more than bored. American Beauty portrays frustration coming in the life of many characters right from the age group of teenage to mid-life crisis adults. Then, each of the character seeks freedom from this daily American lifestyle. 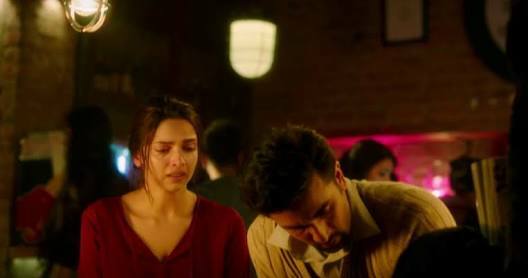 But, Tamasha has more similarity with Fight Club (1999). Fight Club is about an insomniac office worker, looking for a way to change his life, moves into a dilapidated house, forms an underground fight club, pours out all his frustration on the structured society. Just take a look at the scene when hero shows his insane nature to his boss. How Ved behaves with his boss is very similar to how the hero of fight club does when confronted by his boss over hero's recently changed irresponsible behaviour. This one for me counts as one highpoint as hero discovers himself, finds courage to follow his heart, and is free to do whatever he thinks is right irrespective of the societal pressure. Cheers! Another similarity is with earlier movies of Imtiyaaz Ali himself, mostly Jab we met. Deepika's happy go lucky character (like Jab we met's Geet) helps Ved find his inner self. So, what are the differences in this Bollywood drama when compared to Hollywood movies from which it looks inspired? As observed in Fight Club, hero finds truth or his inner self by himself but when you come to the reality of Indian movies they will put a character of girlfriend anyhow. They brainstorm really hard on how to put it in or how can they find any other way of adding some songs. Also, you get to see flavour of 3-idiots in it. Remember the scene where Madhvan convinces his father that his passion lies in wildlife Photography and not in Engineering. Our hero in Tamasha uses some innovative ways to convince his father that for him what Sharma ji thinks hardly matters? The story is not that unusual but lived by many in our generation of choosing career for merely monetary benefits over career of interest. The person sacrifices his interest where he could give his best and not just be a mediocre person for the rest of life. Point is not to live same year every year until we die. Point taken, but the main fallacy with movie is Imtiyaaz assumes somewhat idealistic situations for this inner self to be discovered like Ved belongs to Upper middle class family, has a high profile job in which offers him all desired luxurious life. It would have been better had Imtiyaaz Ali followed story of that Rickshaw guy too till the end. This would have been helpful to drive a point home that being from lower class doesn't mean you can't follow your talent. Another point Imtiyaaz ignores completely is institution of family. Tell me when was the last time you saw parents not pressurising their child for a marriage after a well settled career. We don't see this pressure being built up on either of Ved or Tara though they have continued with their jobs for 4+ years. Lucky Ved & Tara, I must say. 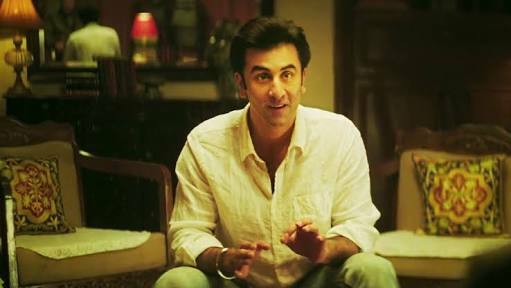 Ranbir has done some refreshing acting in this one. Also, there's a colourful Corsica, Deepika as well as treat of North Indian folk singing. 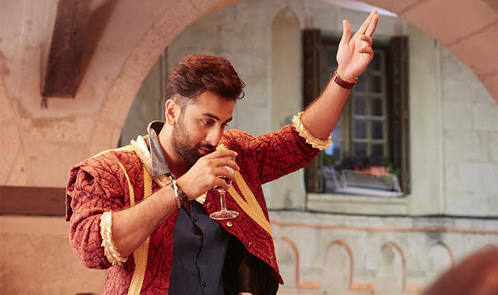 Don't miss Tamasha if you have enjoyed Imtiyaaz's earlier movies like Jab we met and Rockstar.